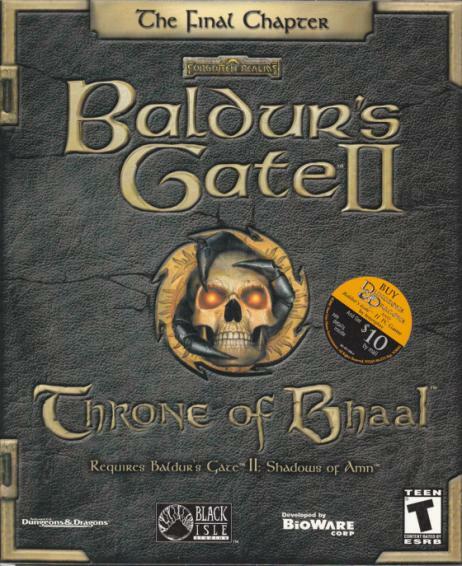 Baldur's Gate II: Shadows of Amn continued the (Child of Bhaal) storyline that began back in 1998 with the release of the original Baldur's Gate and its expansion, Tales of the Sword Coast. The sequel was a huge success, which makes it no surprise that its expansion, Throne of Bhaal, is one of the most anticipated addons in recent times. ToB promises to bring a plethora of enhancements, a dungeon that Bioware has claimed to be one of their finest creations, and will additionally bring the (Child of Bhaal) storyline to a close. Will the expansion be everything that Baldur's Gate fans have come to expect from Bioware? Fortunately, GameBanshee was given the opportunity to play a press release of the expansion, allowing us to present this preview so that you can decide for yourself. Just what sort of enhancements can you expect to see in the expansion? First of all, there's a whole new mage kit called the Wild Mage. Secondly, certain classes have had their previous abilities altered, such as the Wizard Slayer now being able to obtain 84% of base magic resistance. Additionally, all classes can now obtain either special abilities or quest spells as they reach some of the higher levels. The expansion also adds entirely new monsters, some being enhanced versions of previous monsters, while others are completely new. And what's an expansion without adding more spells and equipment (which ToB does generously)? Now add the fact that the experience point cap has been increased to eight million experience points (allowing most classes to reach level 40) and you have all the enhancements you need to bring your Baldur's Gate II gaming to a whole new level. To start off, you are allowed to either create a new game or import a saved game from your previous Shadows of Amn adventures. Starting a new game allows you to take advantage of the Wild Mage, the new mage kit introduced with ToB. You won't have to worry so much about starting the game (naked), as ToB gives your character an assortment of magic items when you begin a new game (not to mention two and a half million experience points). For example, my Wild Mage began with fairly powerful equipped items and a Bag of Holding filled with various weapons and armor. If you don't wish to start over, importing a saved game will allow you to keep all of your existing equipment, as well as any NPCs that were in your party at the time you saved. If any of the characters from your saved game hadn't obtained two and a half million experience points, the expansion will automatically bump them up. Your adventure begins when a cryptic prophecy is revealed to your character, after which you'll find yourself involved in a war between Bhaalspawn (the name given to children of Bhaal) in the city of Saradush. You'll meet up with a protector of Bhaalspawn named Melissan, who will tell you that the city is under siege by one of them and that the town's half-orc leader has lost his mind and locked himself inside the town's castle. You'll need to find a way into the castle, deal with the madman (and his battle mage bodyguards), and then find a way out of Saradush to deal with what turns out to be an invincible Bhaalspawn attacking the city. But don't think you're done just yet. Dealing with the town's mad leader and defending it against an all-out siege is just the first weight upon your shoulders.